The Department of Education is committed to ensuring all students can access, participate and engage in education on the same basis as other students. A culture of professional learning and growth deepens teaching and learning expertise by increasing our capacity to reflect, develop our skills and knowledge, collaborate and in turn improve student wellbeing and learning. Empowering our staff by providing them with quality professional learning is a priority of the department. 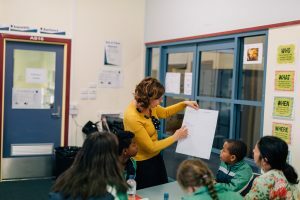 We know developing teaching and professional support practice, skills and knowledge has the greatest impact on learning for all students including students with disability and diverse strengths and needs, and for students for whom English is an additional language. Within the department, Inclusion and Diversity Services is involved in providing a range of professional learning opportunities through direct facilitation and indirectly through partnerships with external programs.